O God, who have taught us to chasten our bodies for the healing of our souls, enable us, we pray, to abstain from all sins, and strengthen our hearts to carry out your loving commands. Through our Lord Jesus Christ, your Son, who lives and reigns with you in the unity of the Holy Spirit, one God, for ever and ever. Historically today is the feast of St. Porphyrius, a wealthy Greek who became a hermit first in the desert of Skete in Egypt and then in Palestine on the banks of the Jordan. Much against his will he was raised to the see of Gaza, which he ruled with extraordinary energy, ability and success. He almost completely uprooted the remnants of paganism in his diocese. His biography written by his deacon Mark is one of the most valuable historical sources of the fifth century. 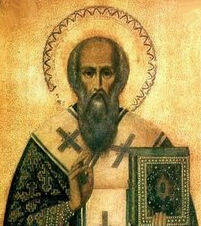 Learn more about St. Porphyrius at A Second Sampson—St Porphyrius of Gaza and also read Deacon Mark's biography, The life of Porphyry, bishop of Gaza.